Moist, flavorful turkey burgers straight from the pages of my favorite cookbook of the summer, Jerusalem. The turkey burgers are specked with grated zucchini and fresh herbs which add moisture, volume and summer flavors. If low-cal burgers have left you hungry for, you know, something "more" – this is your burger! Now that that’s out of the way, know that I am happily poring through Jerusalem, the cookbook that’s taken the food world by storm. It’s filled with inventive Middle Eastern food, lots of fresh vegetables and fruits, lots of food for sharing. Deborah Madison’s back-cover blurb reads, “… filled with passion, color and truly vibrant and fresh ideas”. Heidi Swanson says that Jerusalem “… makes you want to cook … to eat … to travel.” She is soooo right: every page of Jerusalem makes me hungry, makes me “want” to cook, now! Here’s the first recipe, I suspect there shall be more to come! Turkey Burgers with Zucchini are a little spicy – though not “too” spicy, if you know what I mean – so a cold creamy sauce helps balance the experience. Jerusalem’s recipe calls for a Sour Cream-Greek Yogurt Sauce. Alternatives include something like Cucumber Dip with Feta (except I’d use grated zucchini instead of cucumber) or Buttermilk Garlic Salad Dressing or even Homemade Low-Cal & Low-Carb Blue Cheese Salad Dressing used for this Wedge Salad. WHAT IS SUMAC? Sumac is a red spice made from the ground fruit of sumac trees and shrubs. It adds a sour note that I just love and is common in Middle Eastern food. Look for it at Penzeys, at Amazon.com or if you're in St. Louis, Global Foods in Kirkwood. Substitute any full-flavored spice blend in your spice cupboard, we are loving the Weber grill blends! More recipes that call for sumac at A Veggie Venture and Kitchen Parade. ALANNA’s TIPS We made the burgers twice, so-so good! The first time, I used a well-seasoned cast iron skillet. It required more oil to prevent sticking and even then, was slightly fussy to flip the delicate burgers. The second time, I switched to a non-stick skillet and it required less oil (only about a tablespoon) and the burgers turned more easily. Either way, a gentle touch is recommended when flipping. Go ahead and cook any extra burgers, they’re great cold or warmed up the next day. Or try one with an egg on top! 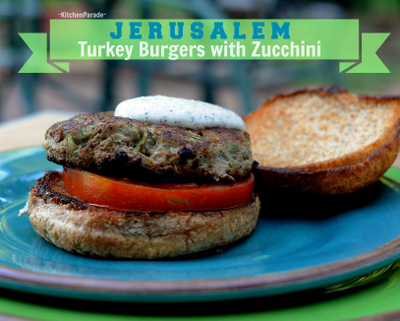 Jerusalem calls this recipe “turkey burgers” but then, in the instructions, refers only to meatballs. Meatballs? Oh yeah, baby, the turkey-zucchini combination would make excellent meatballs! Next time, I plan to substitute ground beef or ground elk from the freezer to make meatballs. Kitchen Parade is written by second-generation food columnist Alanna Kellogg and features fresh, seasonal dishes for every-day healthful eating and occasional indulgences. Do you have a favorite family burger recipe that other Kitchen Parade readers might like? Just send me a quick e-mail via recipes@kitchen-parade.com. How to print a Kitchen Parade recipe. Never miss a recipe! If you like this recipe, sign up for a free e-mail subscription. If you like Kitchen Parade, you're sure to like my food blog about vegetable recipes, too, A Veggie Venture. Follow Kitchen Parade on Facebook! Real Food. Low Cal. Low Carb. Weight Watchers Friendly. Gluten Free (without the bun). Primal. SOUR CREAM-GREEK YOGURT SAUCE Whisk together all the ingredients. Refrigerate until ready to serve. Best made a day or so ahead of time. Makes a generous half cup. TURKEY BURGERS In a small food processor, chop the garlic, green onion, mint and cilantro until fine. Add the egg, cumin, salt, pepper and cayenne and pulse two or three times just until combined. Transfer to a large bowl. With your hands, gently work in the turkey and zucchini just until combined. Form six patties and refrigerate to firm up until ready to cook. Heat about 1 tablespoon oil in a large non-stick skillet until shimmery. Add the burgers and let cook, without moving, until the bottom side browns. Turn over and brown the other side, make sure the centers are cooked through, not pink. TO SERVE Make your burgers and dig in with gusto! MAKE-AHEAD TIPS If you can, definitely make the Sour Cream-Greek Yogurt Sauce a day or so ahead of time. To get dinner on the table, faster, later, mix the Turkey Burgers’ garlic-onion-herb mixture a few hours ahead of time. Don’t mix in the turkey and zucchini until almost ready to cook the burgers, however: we’re talkin’ turkey here. NUTRITION INFORMATION Burger Only: 135 Calories; 5g Tot Fat; 1g Sat Fat; 84mg Cholesterol; 459mg Sodium; 3g Carb; 1g Fiber; 1g Sugar; 18g Protein. WEIGHT WATCHERS POINTS WW Old Points 3, WW PointsPlus 3 CALORIE COUNTERS Make 8 burgers for 100-calorie burgers. These recipes have been Alanna-sized with reductions in fat. NUTRITION INFORMATION Burger + Sauce + Bun, sorry, I’m not going to calculate this information since buns vary so widely in size and calories. I am in love with this cookbook, and love the sound of these burgers with zucchini! What a terrific idea, these burgers (or meatballs) sound delicious. And, on your advice a while ago I picked up sumac, and used it earlier this summer for a fattoush, and liked the flavor. This just looks so incredible! I love it when people give a new spin to burgers as they're usually in danger of becoming pretty boring, but this one just looks so so delicious!